FOR WHOM ARE SUPPORT GROUPS PARTICULARLY BENEFICIAL? WHERE CAN THE ASI-MV® BE USED? Adjunctive treatments, in which patients are provided additional modalities that can assist in their behavior change or the maintenance of their behavior change (i.e. telehealth, psychoeducation, consumer-driven treatment planning), have a useful role in addressing problems that can't be solved by face-to-face meetings. The adjunctive therapies covered in this book are all based on improving patient’s self management of their problems or the factors that exacerbate their problems. The book is broadly organized into two sections. 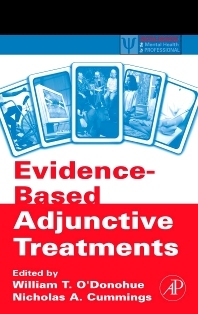 The first gives a broad overview of the major adjunctive modalities and the second concentrates on a systematic description of their role in the treatment of a number of special populations while providing practical suggestions for the timing and coordination for the use of the adjunctive therapies discussed in the book. Mental health professions and practitioners who need a book that covers the key difficulties that they face every day in their practices. William O'Donohue is the Nicholas Cummings Professor of Organized Behavioral Healthcare at the University of Nevada, Reno. He is also an Adjunct Professor of Psychiatry and Philosophy. He has authored over 100 articles and chapters and co-edited more than 15 books. Nicholas A. Cummings, Ph.D., Sc.D. is the President of the Foundation for Behavioral Health and Chairman of the Nicholas & Dorothy Cummings Foundation, Inc. He was the founding CEO of American Biodyne (MedCo/Merck, then Merit, now Magellan Behavioral Care). He is also the former President of the American Psychological Association. Dr. Cummings was the founder of the four campuses of the California School of Professional Psychology, the National Academies of Practice, the American Managed Behavioral Healthcare Association, and the National Council of Professional Schools of Psychology. He was also the Chief Psychologist (Retired) at Kaiser Permanente. He was the former Executive Director of the Mental Research Institute. Currently, Dr. Cummings is a Distinguished Professor at the University of Nevada, Reno. Janet L. Cummings, PsyD., is President of the Nicholas & Dorothy Cummings Foudation, Inc., and former staff psychologist at American Biodyne (MedCo, now Merit Behavorial Care). She earned her Doctorate at the School of Professional Psychology, Wright State University, 1992. Distinguished Chair in Psychology, University of Nevada, Reno; Chair, Board of Directors of The Nicholas and Dorothy Cummings Foundation, Inc., Scottsdale, AZ, USA President, The Nicholas & Dorothy Cummings Foundation, Scottsdale, Arizona, U.S.A.